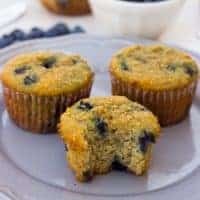 Coconut Flour Blueberry Muffins! If you’re looking for an EASY, healthy muffin recipe that uses only coconut flour this is it! Preheat the oven to 350F. Line a muffin pan with paper liners. In a large bowl, whisk together the eggs, coconut oil/butter, applesauce, honey, vanilla and cider vinegar. Add the coconut flour, baking soda, and salt and mix to thoroughly combine. Stir in the blueberries. Scoop the batter into the prepared muffin pan, filling each one 2/3 the way up. Sprinkle each muffin with a bit of sugar/chopped pecans, if using. Bake for 17-20 minutes, until a toothpick inserted into the center of a muffin comes out clean. Allow to cool 5 minutes in a pan. Transfer to a wire rack and cool completely. Enjoy!